Inspite of being an avid reader, I have never been a big fan of short stories. Be it a bookstore or a library, the words ‘short stories’, would make me automatically put the book back and move onto the next one. One Sunday evening, at a local bookstore in Colaba, the title Breathless in Bombay caught my eye. To me it looked more interesting than a Maximum City or Mumbai fables. This time the words ‘short stories’ written at the bottom of the cover thankfully did not meet my eye, but the blurb – ‘Shortlisted for Best First book Europe and South Asia Commonwealth Writers Prize 2009’ did. I picked it up without a second thought. Charmed by the city and her effervescent personality many authors have based their stories on this megapolis and her various moods. 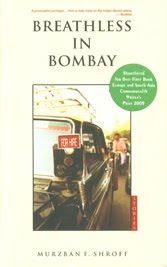 One such book is Breathless in Bombay. The book starts with a scene from Dhobi Ghaat and takes the reader on a journey through the famous Chowpatty beach, Nariman Point, and into the lives of the taxiwaalas, the local goons, prostitutes, and rag pickers. The rich Parsi families and Page 3 junta also join the bandwagon after a few pages. In a melting pot of varied lifestyles, it is commendable how Mr Shroff has managed to capture the showbiz and the appalling poverty alike, down to the last detail. The stories are weaved in the most engaging manner and the characters actually come alive in your mind! A few of the stories are narrated by the author himself and revolves around his queer neighbors and acquaintances. My favourites are Traffic, Haraami, Babu Barrah Takka, and the title story Breathless in Bombay. Traffic talks about a young production assistant, Vicki Dhanrajgiri, and her efforts to be the ideal friend and lover to the highly talented and insecure artist, Nandkumar Chaurasia. In Haraami, we come across a self centered and immature advertising executive, Rohit, who the author tries to befriend and is later shocked at Rohit’s spinelessness and the ‘i-care-for-none’ attitude. In Babu Barrah Takka, we are introduced to Madhulikar Srini, a hard-working public official, who is forced to choose between his conscience and his family’s happiness. The last story, Breathless in Bombay, discusses how a corporate honcho, Aringdham puts his penniless past and parents behind him to chase his dreams, and the love of his life, Ritika. Based on human relationships, each story carries a subtle message and highlights a unique personality trait of the protagonist. Mr Shroff has also taken the effort to not mask the harsh reality and in some cases the poverty is almost hard to believe! All the characters have their own inimitable style of dealing with what the city has thrown them into, no matter how good, bad or ugly it may be. A good compilation of interesting short stories, I urge you to add this to your list of ‘Must Reads'. If not obsessing over a book or weaving a story in my head, then I am busy putting the ‘pro’ in procrastination. Day 13 - Overanalyze this, and that! Of Shapes in the Clouds and other things..
Who Will Marry Me Now?